Here is a sermon about Jesus’ power to open the innermost ears of our souls to hear the good news of God’s love, and then to open our mouths–and lives–to share that good news. We don’t know what had gone wrong. We don’t know what caused the man’s hearing loss. It could have been a problem from birth. It might have been the result of ear infections or injury. One overly loud noise is all it takes to cause permanent damage. My father-in-law traces his hearing loss to machine gun practice during basic training after he got drafted. Dad served in the Philippines during the Korean War. 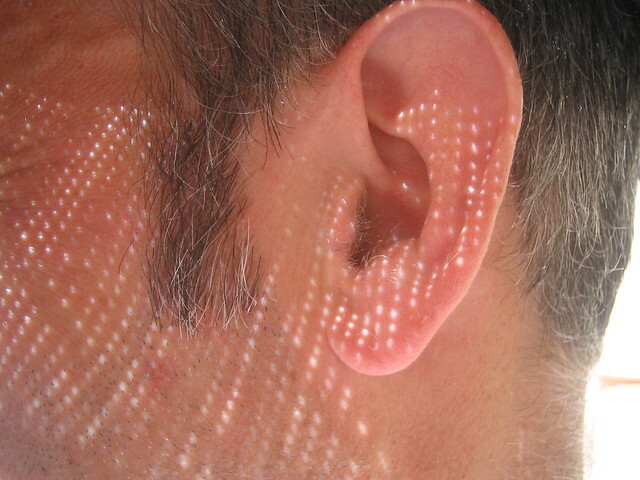 People can experience hearing loss as a blanket of silence, or as the loss of some sounds. Many people that are hard of hearing experience tinnitus—ringing in the ears, phantom sounds ranging from high pitched whistles and hissing to wailing sirens or blaring musical notes. These unreal noises drown out the real sounds that they want to hear. The ringing in my ears sounds so much like the sounds on the hearing test that I often can’t tell if the sound I’m hearing is real or not. The man in the gospel story had hearing loss, and he also had difficulty speaking. Hearing and speaking go hand in hand. Most people learn to speak by hearing and repeating what they hear. It really is a miracle. When they come into the world infants already recognize and respond to their parents’ voices. When our daughter Laura was a year old, we saw very clearly that she was well on her way to learning how to talk. One night she came downstairs after my mother had given her a bath, and I said in a sing-songy voice, “Hi, clean girl!” And Laura imitated my exact intonation: aye een irl! It was only missing some of the consonants. Ordinarily children are born able to hear and imitate the sounds of all languages. The sounds they hear and repeat get reinforced, and the ability to make the sounds they don’t hear falls away. After a while it gets so that what you don’t hear, you can’t hear. That is why it is much harder to learn to hear and speak another language later in life. Children learn to hear and reproduce music in the same way. And that is why we encourage babies and toddlers and their caregivers to participate in Music for Little Friends, our children’s music classes. It develops their musical ears and their ability to make music. When I read that, I thought about how every child needs to hear that message, and about what happens when children don’t hear those words in some form. They might get so they can’t hear those words, or can only hear them after a major breakthrough.